This post was sponsored by Path of Life. Whether you’re a meat eater or not, you’ll love these roasted cauliflower tacos made with Path of Life Organic Rainbow Cauliflower. With this recipe, dinner can be ready in under 30 minutes, and it’s also gluten-free, dairy-free AND vegan! I think it’s safe to say that tacos are easily my favorite food. I can honestly eat tacos every day and never get sick of them… I mean the flavor options are endless! In fact, I’ve had steak tacos, shredded BBQ pork tacos, fish tacos and now these cauliflower tacos ALL this week! These cauliflower tacos have definitely become one of my go-tos for easy vegetarian tacos (they’re actually also vegan!) 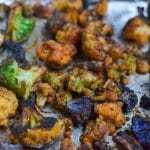 They take just about 30 minutes to prepare from start to finish and are loaded with vegetables and tons of flavor. For this recipe, I used Path of Life Organic Rainbow Cauliflower for a quick and easy way to make these cauliflower tacos. I’ve been loving Path of Life products for the past few months, since we moved into our new condo. Working full time on top of running a cookie business and this blog of mine can sometimes leave me short on time to make dinners or lunches. Not to mention I’m still furnishing our new condo. Path of Life makes these great frozen vegetables and sides that can be steamed in the microwave in just about 4 minutes and they become a great base for whatever meal I’m planning. And guess what? They’re all naturally gluten-free! I’ve loved being able to microwave my grain or vegetable side while I’m cooking a piece of chicken or salmon and and have dinner ready for two in about 20 minutes. Talk about a time saver! Path of Life products also work great as a part of a recipe, such as this one. If you like cauliflower, then you’ll love these tacos. The cauliflower is tossed in taco spices and oil and then gets roasted in the oven until it’s super tender and if you’re like me.. little bit charred. Then we top it with our tangy cabbage carrot slaw and creamy avocado slices. I keep mine dairy-free, per usual, but feel free to add a little bit of cheese, too! The combination of these flavors will have you wanting to make vegetarian tacos ALL the time — and I promise, you won’t miss the meat one bit! Whether you're a meat eater or not, you'll love these roasted cauliflower tacos made with Path of Life Organic Rainbow Cauliflower. With this recipe, dinner can be ready in under 30 minutes, and it's also gluten-free, dairy-free AND vegan! Preheat oven to 450F. Line a baking sheet with foil and set aside. In a bowl, mix together avocado oil, chili powder, cumin, garlic powder, salt and cayenne pepper and stir until combined. Add the frozen cauliflower and toss until completely coated. Place the cauliflower on the baking sheet in a single layer. Bake for 20-25 minutes, or until cauliflower is lightly browned and tender. While cauliflower is baking, make the cabbage slaw. In a bowl, whisk together oil, apple cider vinegar, lime juice, lime zest, fresh cilantro, salt and pepper. Add in the shredded cabbage and carrots and mix until combined. Let sit while the cauliflower is roasting to let the flavors meld. Warm corn tortillas in the oven for a few minutes. To assemble, add a few slices of avocado, cabbage slaw, and roasted cauliflower on top of the corn tortilla. Top with a little bit of fresh cilantro and a squeeze of lime juice.